You are here:Home / Posts tagged "kimchi"
We already know what kimchi is – it’s the ultimate and most ubiquitous side of dish of Korea. As they say, a Korean meal is not complete if there is no generous serving of kimchi on the side. We also revealed in another article that kimchi is so distinctly embedded in Korean culture that Koreans even buy a separate fridge just for it! There are a lot of kimchi varieties out there (and you can make your own version of kimchi as well), but the recipe below is for your typical pungent and tasty napa cabbage kimchi. You might actually be surprised as to how easy it is to make your own kimchi at home. Let’s get started! Quarter the napa cabbage, wash and drain. 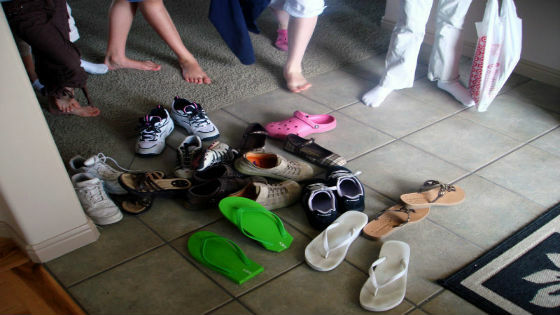 Mix ½ cup sea salt (or any coarse salt) and 1 cup water. Put cabbages in a salted water and take out one at a time to get salt down. In a container, add cabbages and pour salted water, set aside for at least 6–8 hours (overnight will be great). The cabbage should be soft enough to bend. Mix together ½ cup go choo ga roo (Korean chili powder), 2 tsp salt, 1 tbsp sugar, ¼ cup jeot gal (Korean fish sauce), 2 tbsp minced garlic, and 1 tsp minced ginger. Mix in vegetables to the chilli powder mixture. With 2 outer leaves, wrap the whole thing securely. Put it in a airtight container. Let it sit on a kitchen counter for overnight. The recipe above is so easy to make, but if in case you don’t have the time to make your own kimchi, the Korean BBQ Online has your back. We deliver the best-quality kimchi that you will ever taste straight to your doorstep. Give us a try today! You can never call yourself a Korean foodie unless you have tried bibimbap, which is often considered as Korea’s national rice dish. Bibimbap is a bowl of rice topped with egg and various vegetables. If you are planning to make your own bowl of bibimbap at home, then the vegetables that you put on top is completely up to you. However, you will usually see bean sprouts, carrots, spinach, chestnuts, gosari, and bell pepper, among others, in a typical bowl of bibimbap. Chili paste is also served on the side if you want to give the taste of your bibimbap more kick. If ever you will eat in a restaurant, then you will sometimes see a bowl of bibimbap with all the vegetables already mixed in or the vegetables served separately. 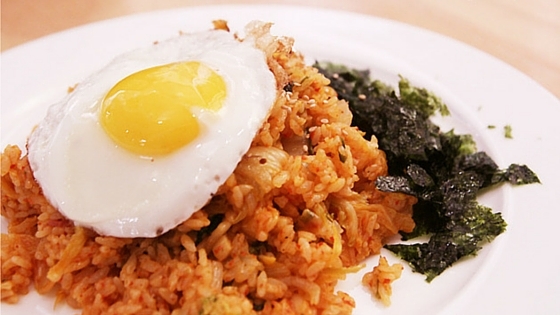 Another Korean rice dish that is very common and easy to make is Omeuraiseu! 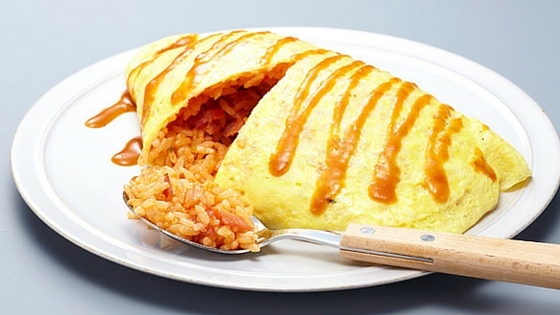 The Korean word is abbreviated from the English words Omelette and Rice and is the korean intepretation of the humble English omelette. A paper thin egg layer rests upon a mountain of delicious fried rice. Often topped off with a splashing of tomato sauce, this is a nostalgic comfort food for most Koreans, and one very delicious meal! 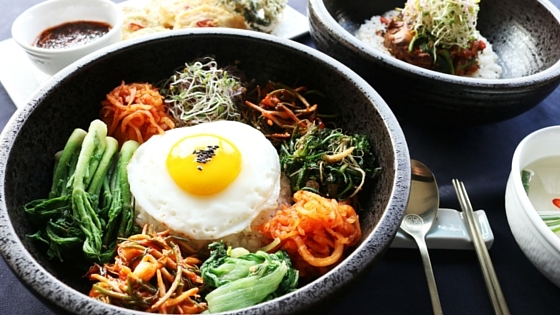 Dolsot Bibimbap is almost similar to your regular bibimbap because it also features mixed vegetables on top of rice. The difference between the two is that Dolsot is served on a hot crock whereas a regular bibimbap is served on a cool bowl. 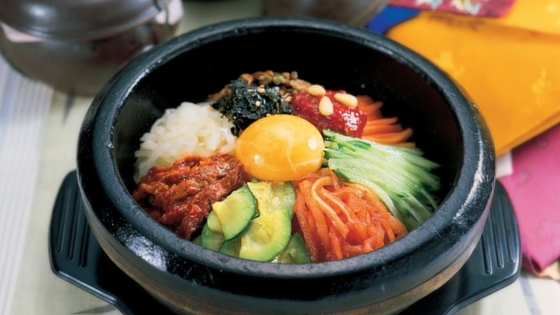 Dolsot also has more ingredients that a typical bibimbap. Given the variety of ingredients featured in this rice dish, it is then important for the rice and the ingredients to be mixed well. Do not forget to pour some hot water on the crock to remove the rice that got stuck on the sides so you can still eat them. 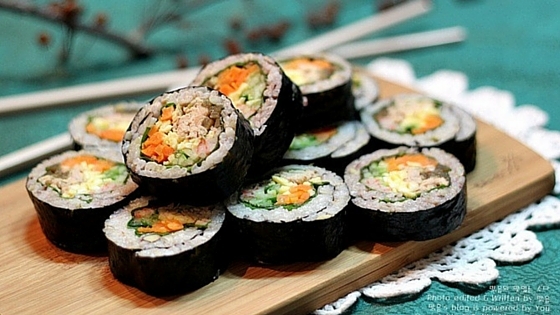 Gimbap (or Kimbap) is a seaweed-wrapped rice roll that is widely available and distributed in Korea. If you want a cheap yet nutritious Korean dish, then gimbap should be one of your top picks. It is also very easy to make: you spread some cooked rice over a square piece of gim and then you add a variety of meats and vegetables on top. 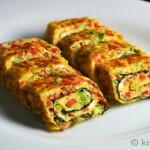 Typically, gimbap has cucumber, spinach, carrots, crab meat, and sausage among others, but you can certainly experiment on some ingredients to make your own version of these savoury rice rolls. 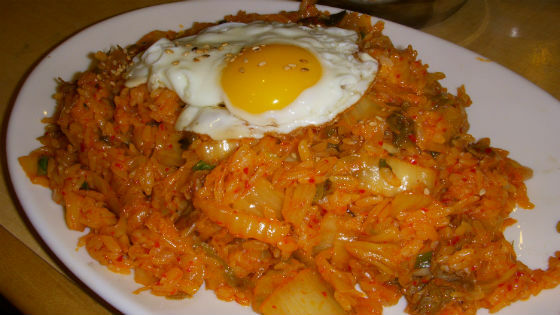 Don’t throw away that Korean kimchi just yet because you can still use them in making the Kimchi Bokkeumbap. 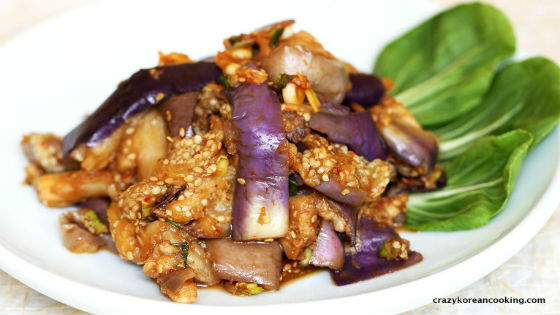 Just fry that kimchi and add it, together with some vegetables and meat of your choice, on your steamed rice. Putting some fried egg into your bokkeumbap will also do some wonders. 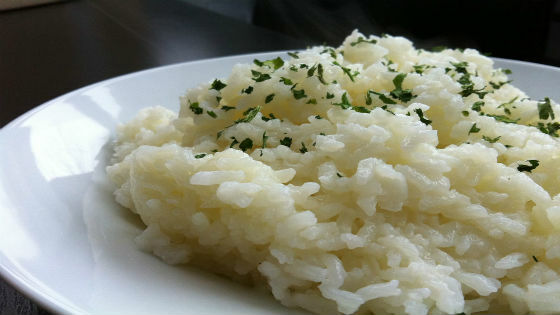 This dish is so easy to make that a lot of people who are on a tight budget prefer to enjoy this rice dish. 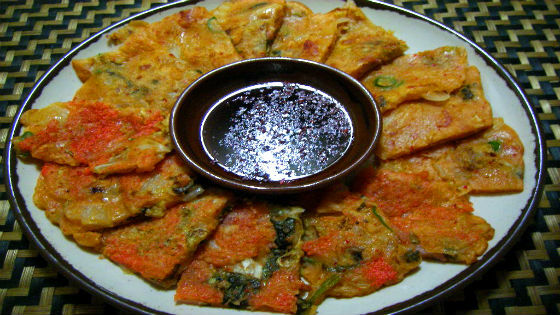 Are there any Korean rich dishes that you would like our readers to try? Comment below so we can check them out! And if ever you’re considering to host a Korean BBQ party anytime soon or you just want to stock on some meats for the future rice dishes you are going to create, then do not forget to contact us. Cheers! 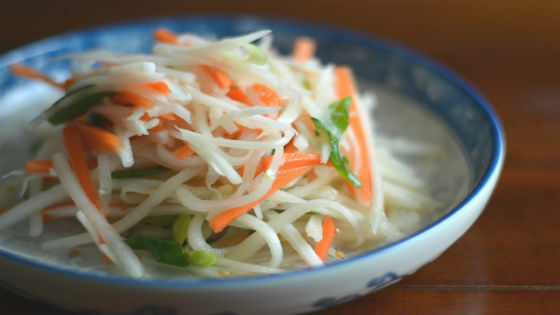 A talk about Korean cuisine will never be complete without mentioning kimchi. For Koreans, kimchi is not just your ordinary side dish of sliced cabbage, red chili, radish, garlic, ginger, anchovy paste and scallions. Kimchi is actually a national symbol of Koreans’ strong and passionate character, owing to the dish’s sour and spicy taste. Not a lot of people prefer eating kimchi because of its strong taste, but Koreans certainly appreciate foreigners who have the guts to finish a plate of it. 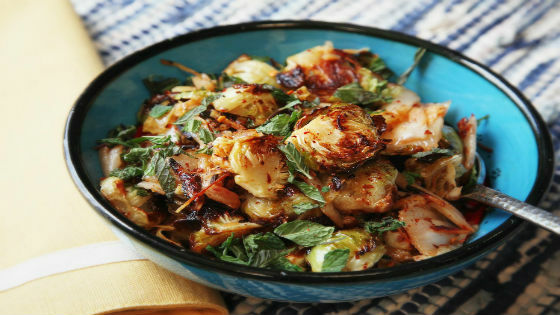 If you’ve always thought that kimchi is always made out of cabbage, then allow us to enlighten you. Kimchi actually has over a hundred versions that feature a whole lot of main ingredients. 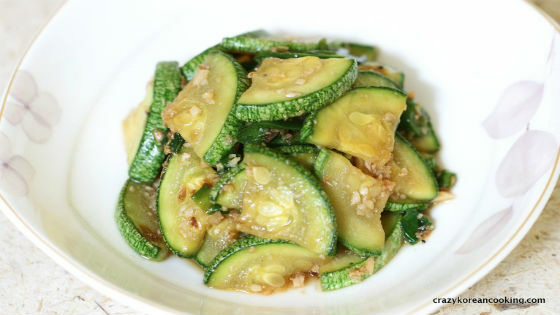 Some kimchis are made out of cucumber, bossam, and radish, among others. And just to clarify, the word kimchi itself actually refers to the process of vegetable fermentation and not on kimchi’s ingredients themselves. 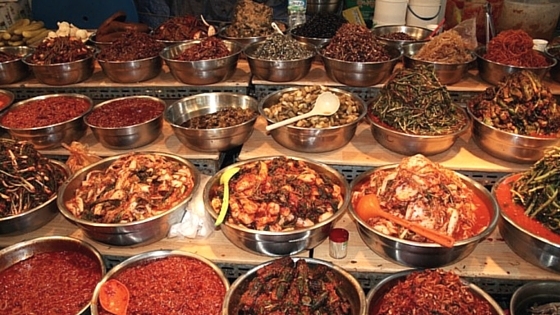 Koreans eat different varieties of kimchi depending on the season. 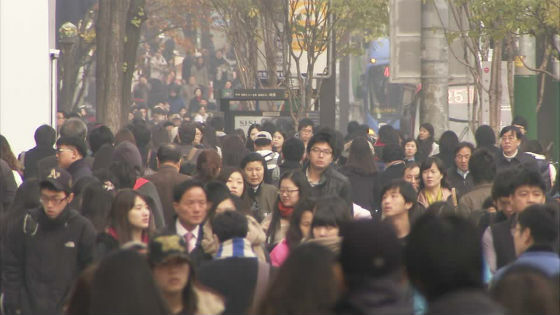 If it’s winter time, then the most popular kimchi variety being consumed is radish water. 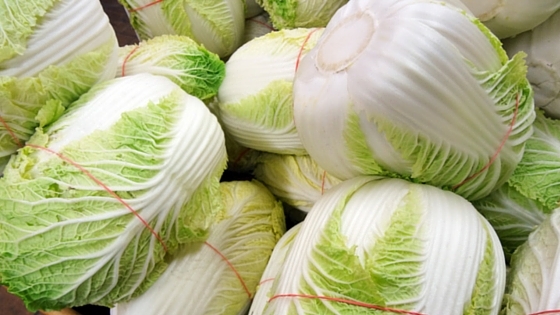 The more common cabbage kimchi is consumed more during the fall, cucumber is eaten more during the summer, and green onions during spring. And as Korea is a vast country, its regions also feature different varieties of kimchi where the strength of the flavors and ingredients generally differ. 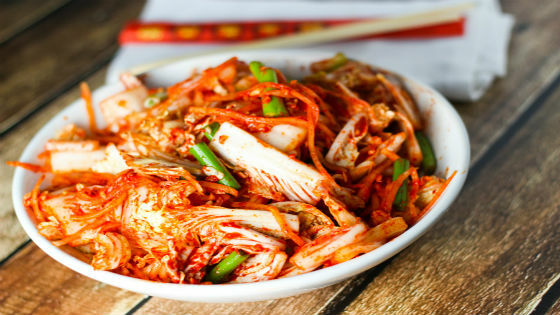 Kimchi is actually a very healthy side dish that is packed with antioxidants, important vitamins, and good bacteria. Some credible research has shown that eating kimchi can help strengthen one’s immune system to prevent the human body from contracting bird flu and some forms of cancer. Some even say that kimchi is so healthy it will lower your risk of having a heart attack and diabetes. Keep these in mind, folks, whenever you’re initially turned off by the smell of kimchi. 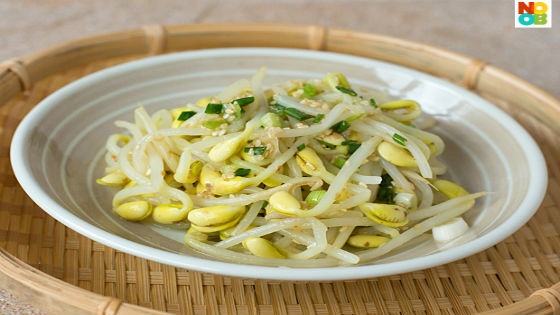 This side dish is actually very good for your body! 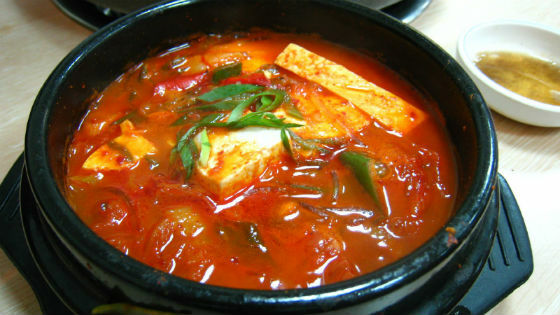 Kimchi came into existence because Koreans back in the day didn’t have refrigerators to preserve their vegetables. 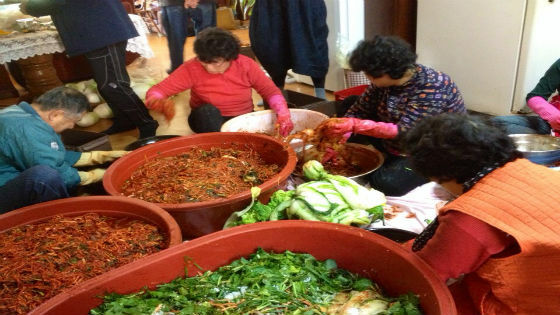 As a result, families gathered together and helped in the fermentation process, which involved cutting, mixing and salting of vegetables, so that they will have enough stock of vegetables to eat come winter time. 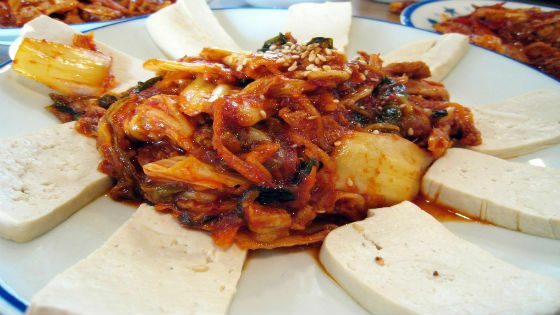 As you may already know by now, kimchi is such a highly important dish to Koreans. But it might still surprise you that Koreans purchase a separate refrigerator for storing their kimchi. 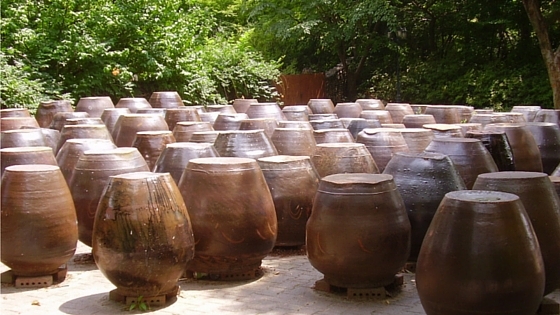 Back in the day, kimchi was just stored in underground clay pots to achieve the desired temperature to complete the fermentation and preservation process. 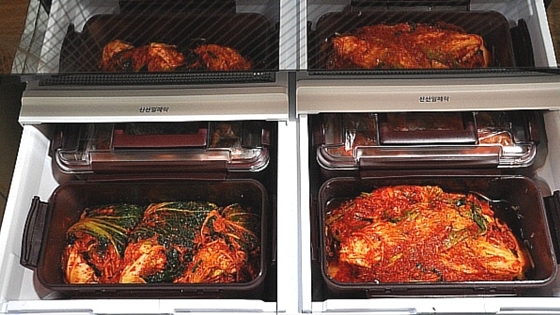 Now, Koreans buy specially designed refrigerators for kimchi that can provide the exact temperature being achieved when stored in clay pots. It also makes sense to store kimchi in a different refrigerator so that its smell won’t affect those of other goods and produce like milk, fruits, vegetables, etc. Kimchi used to be not spicy as the red pepper didn’t get introduced to Koreans until the 1500s, and the Koreans didn’t get to add this as an ingredient to kimchi until the 1800s. 7. Kimchi has already reached the outer space! 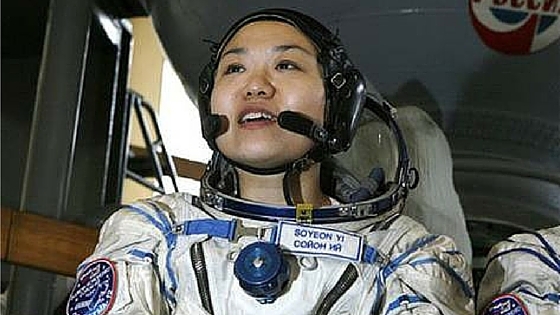 Yi So-Yeon became the first Korean astronaut to fly in space in 2008, and as you may have guessed, she brought some kimchi along with her to outer space. She even hosted a traditional kimchi dinner while she was up there! 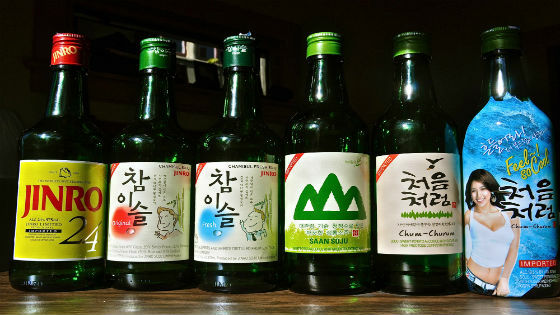 The Korean government spent millions of dollars for their space program, and included in this venture is the extensive research that was done to figure out how fermentation could be slowed down. Studies had also been conducted to determine how kimchi would behave in space and react to various outer space forces. 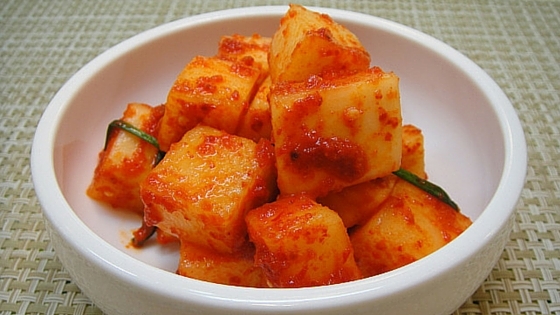 Do you know any other interesting facts about kimchi? Share them all below. 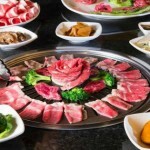 And if through this article you suddenly experienced some craving for Korean BBQ, then Korean BBQ Online has your back! 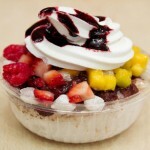 Check out our menu and see how we can serve you today.